This book provides a comprehensive introduction to the thermal issues in photovoltaics. It also offers an extensive overview of the physics involved and insights into possible thermal optimizations of the different photovoltaic device technologies.In general, temperature negatively affects the efficiency of photovoltaic devices. The first chapter describes the temperature-induced losses in photovoltaic devices and reviews the strategies to overcome them. The second chapter introduces the concept of temperature coefficient, the underlying physics and some guidelines for reducing their negative impacts. 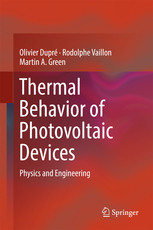 Subsequent chapters offer a comprehensive and general thermal model of photovoltaic devices, and review how current and emerging technologies, mainly solar cells but also thermophotovoltaic devices, can benefit from thermal optimizations.Throughout the book, the authors argue that the energy yield of photovoltaic devices can be optimized by taking their thermal behavior and operating conditions into consideration in their design.